When we talk about tribals, the first thing that strikes us is their poverty and association with jungles. Yet in jungles they live with a strong sense of aesthetic. Years of living in the forest have not isolated them; they have exchanged their ideas with other tribal and non-tribal communities through out their history. The ideas with aesthetic are seen in their objects of daily use, ritual shrines and their living cottages. In Orissa, which is home to sixty-two tribals, one interesting aesthetic idea of their cultural heritage is seen in their combs. 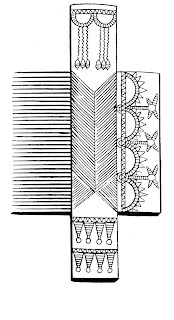 About 12 to 15 tribes know the art of comb making. The rest who don’t make combs, don’t have to buy it. They can get it as a gift or in exchange of agricultural surplus from others. 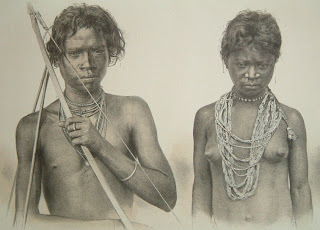 In the tribal society, art creation is a largely unstructured, communal activity that gives the individual a sense of belonging to his/her community. Art is created as one lives and performs different activities within the community. 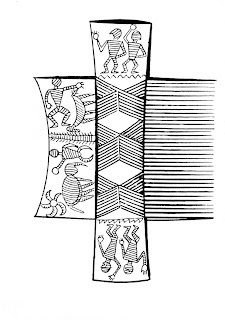 The combs of Juangs are known for their intricate etchings, which are of different shapes and sizes and made of either timber or bamboo. The variety and range of depiction of objects is simply fascinating. 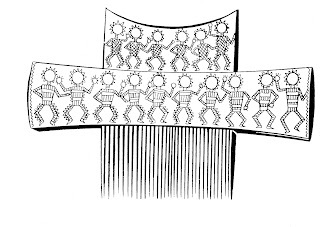 The human figures are stylised and so too are the figures of animals such as horses and elephants enclosed within spaces created by geometric designs. However, the patterns are for beauty; they have no other meanings. The first time I saw Juang combs was in the Tribal Museum in Bhubaneswar. Anwesha Tribal Arts and Crafts, a non-governmental organisation has been reviving the Juang combs for modern house decorations. The readers of this blog if interested can contact Anwesha for further information.